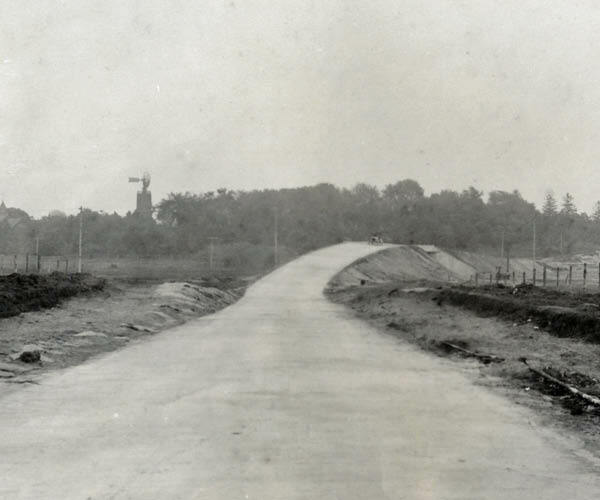 Vanderbilt Cup Races - Blog - Mystery Foto #34 Solved: The Long Island Motor Parkway in East Meadow Looking East From Merrick Ave. Looking east from the Merrick Avenue Motor Parkway Bridge in East Meadow (my childhood hometown) towards the Emily Ladenburg Estate. The windmill of the Emily Ladenburg Estate. The estate was called the Oasis since it had theonly trees in this section of the Hempstead Plains. 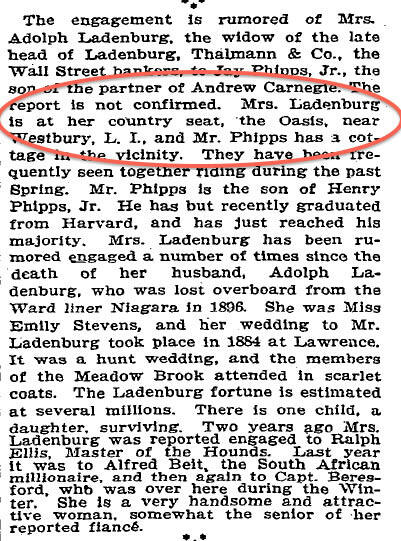 Emily Stevens Ladenburg was the widow of investment banker Adolf Ladenburg who was "lost at sea" in 1896. The firm of Ladenburg Thalman continues today as a major investment banking services company. Emily Ladenburg was the daughter of Alexander and Mary Stevens of Lawrence, New York and a descendant of U.S. Secretary of Treasury Albert Gallatin. In 1909, Mrs. Ladenburg shocked society at Saratoga, New York by introducing the split skirt for horseback riding. 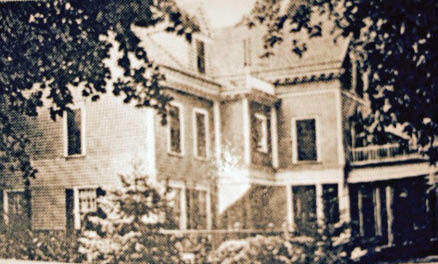 In 1950, the property was sold by the Ladenburg descendants to a real estate developer. The estate consisted of a 14-room house, a stable, a five-car garage and the windmill. What was the approximate date of the photo? Provide a rationale. -No guard rails on the Meadowbrook Bridge. -The photographer's Buick on the bridge. This car has been seen in previous September 1908 photos. Congratulations to Michael LaBarbera, Greg O., Tim Ivers, Steve Lucas, Joseph Gaeta, Gary Hammond, Art Kleiner (see below Kleiner's Korner) and Ariejan Bos for correctly identifying the location and structures. Kudos to Greg O., Steve Lucas, Gary Hammond, Art Kleiner and Ariejan Bos for identifying the approximate date of the photo. The Alco Black Beast conquered the Port Jefferson Hill Climb last Sunday. This wonderful photo was forwarded by Jeff Payne. More photos and videos will be posted later this week. Please send your best Port Jefferson Hill Climb photos to me at Howard@Kroplick.com . The distinctive windmill of the Ladenburg property can be senn on the left. The "Meadowbrook" Parkway Bridge over Newbridge Avenue (Bellmore Road) in East Meadow. Note the photographer's Buick on the bridge. The Stewart Avenue Highway Bridge in East Meadow. 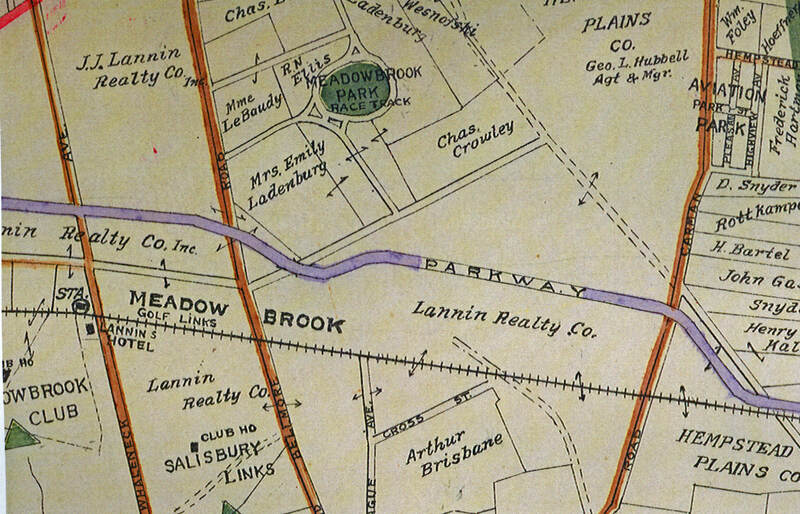 As seen in this Belcher-Hyde map, the Long Island Motor Parkway circled the Ladenburg Estate. Emily Ladenburg refused to sell any of her property to the Motor Parkway. 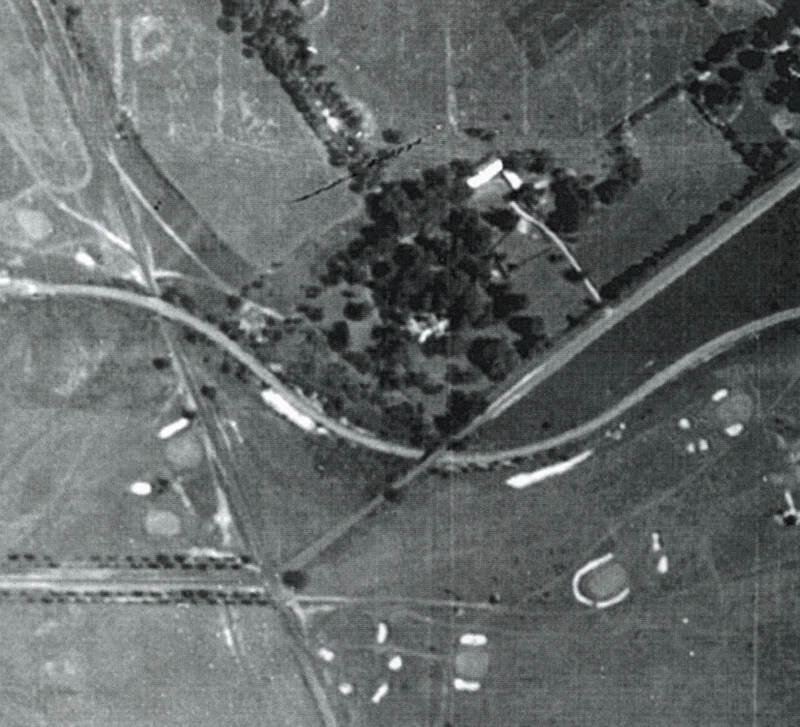 A 1938 aerial of the Ladenburg property. Adolf Ladenburg was lost at sea on February 20, 1896 on a voyage from the Bahama Islands to New York City. He was a partner in the investment banking firm of Ladenburg, Thalman & Company. 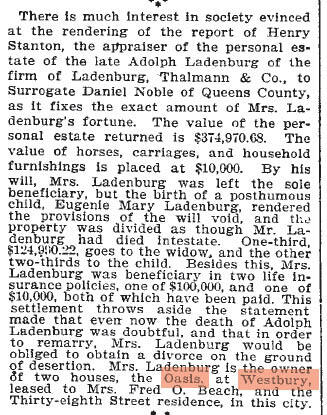 Adolf Ladenburg's estate including the Oasis in Westbury was split between his widow Emily Ladenburg and his daughter Eugenie, who was born after Adolf's death. This is a view looking southwest of the “Meadowbrook” parkway bridge over Newbridge Avenue (Bellmore Road) in East Meadow. The “Meadowbrook” parkway bridge, the Stewart Avenue Bridge, and of course, the windmill of the Ladenburg property can be seen in the background. -What was the approximate date of the photo? Provide a rationale. The LIMP is not completed. There are no guardrails yet. Also, zooming in it looks like our familiar photographers Buick on top of the bridge in the background and we know the date from the other photos from on top of the Carmen Ave bridge and also a photo of the Buick and assistant on top of Westbury Road Bridge. Howard, right in your old backyard. “Meadowbrook” at Newbridge Avenue/Meadobrook Road in Westbury (East Meadow) at Eisenhower Park. The background trees were on Mrs. Ladenberg’s estate, as well as the windmill seen in the left background as you look southeast in 1908. This appears to be looking east between Merrick Avenue and Newbridge Avenue in East Meadow with the parkway bridge over Newbridge Ave. (Bellmore Road) in the center. Further east we see the highway bridge under Stewart Avenue. The windmill on the Ladenburg property can also be seen. The photo was probably taken in September, 1908 since the guard rails on the bridge have not been installed yet and I think I see the Buick on the bridge which was used by the photographer who took many photos at this time. 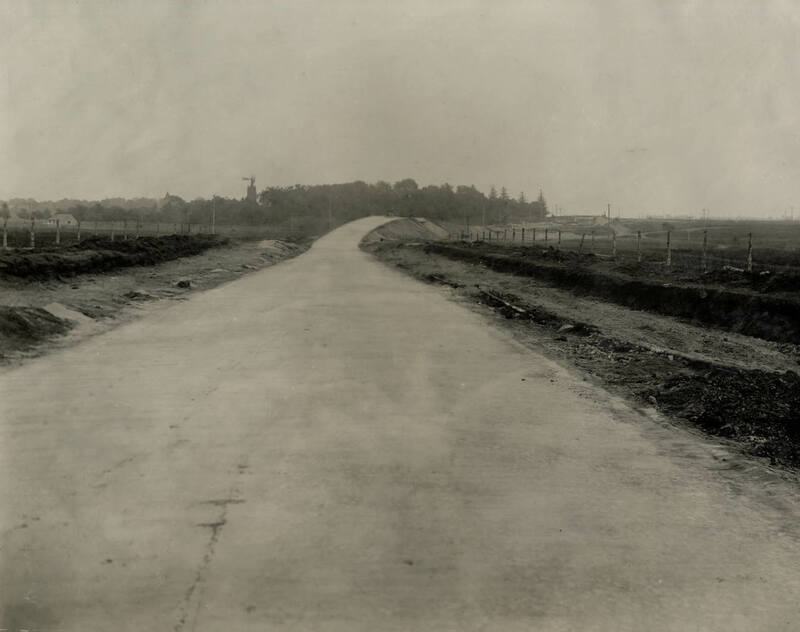 This photo is very early, 1908-1909, while the LIMP was still paving with only concrete, before blacktop was used to cover it. I would tend to think it is one of the more original sections, from Round Swamp to Levittown. I will explore more, and make my guess. It looks to be the present day Salisbury Pk. 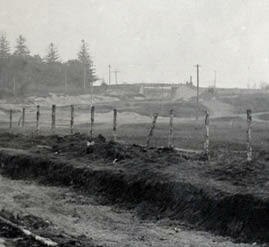 Dr. looking south just before the Stewart Ave. fork in present day Salisbury section of Westbury. A good landmark is the Ladenberg Estate’s windmill to the left. Further ahead in the distance you can see the original east/west LIRR overpass which passed through present day Eisenhower Pk. My best guesstimate would be around the time of 1905 VCR…? The Meadowbrook Bridge over Bellmore Road/Newbridge Ave. In background is the bridge over Stewart Ave.
Identify this section of the Motor Parkway and its orientation: Meadowbrook/Newbridge Motor Parkway Bridge in East Meadow/Westbury area. View is looking southeast towards the Ladenberg property aptly named the “Oasis”. Motor Parkway bridge and Ladenberg property mentioned above. Also the Stewart Avenue Bridge. The tall structure on the left is the Ladenberg windmill. What was the approximate date of the photo? 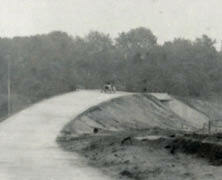 circa 1908, but prior to the Motor Parkway having been opened. I don’t see posts along the bridge’s roadway as other pictures show. On the photo we’re looking east and we can see the Meadowbrook bridge in the foreground, followed by the Stewart Avenue bridge in the background on the right. On the left in the background the Ladenburg windmill can be seen. Also on the left in the foreground some kind of house or shed is visible, possibly belonging to the Ladenburg property. The photo must have been taken in the fall of 1908 during the construction of the Motor Parkway, because no fencing is present yet along the sides of the bridge. i lived off stewart ave i new mr bolsen lived on bolsen dr off ladenburg dr he was 93 yrs old his 2 daughters were in there 70s mr bolsen had many horse related items in his basement the house is still there today. Peter - I sent you two e-mails concerning the Ladenbergs, hope you got them. I know the Bolsen house and am frequently in the area.